Hey, it’s December and the busiest time of year for both work and family. 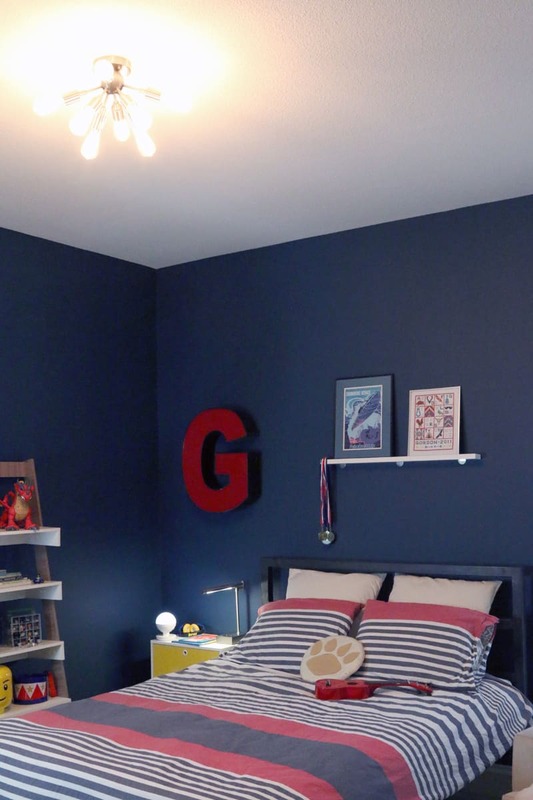 Let’s take on a big project like making over a kid’s bedroom! 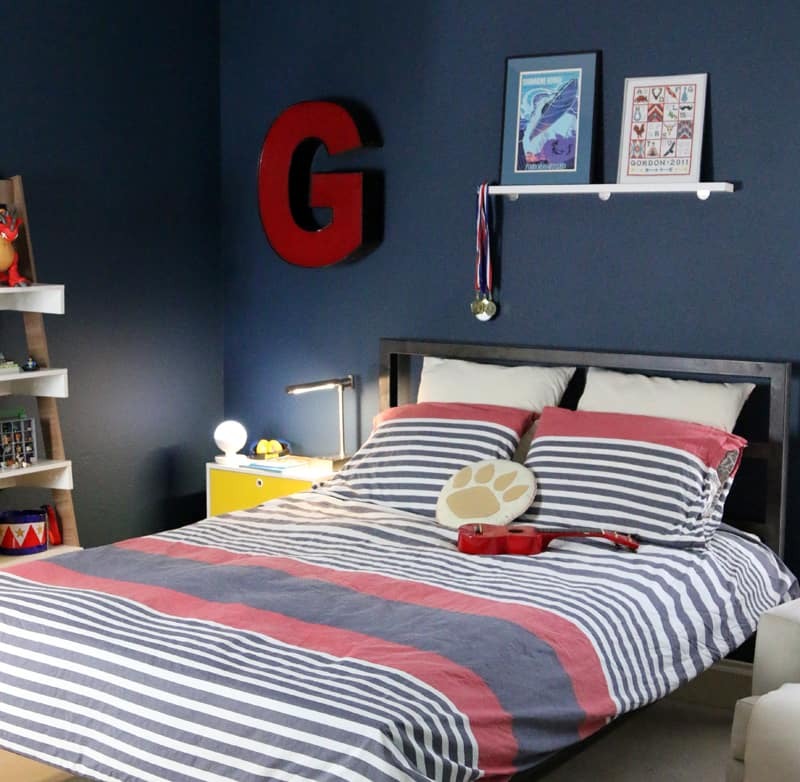 The timing may not have been perfect but Gordon is so thrilled to have his big boy bedroom finished. (See photo below: that is his thrilled face, I swear.) 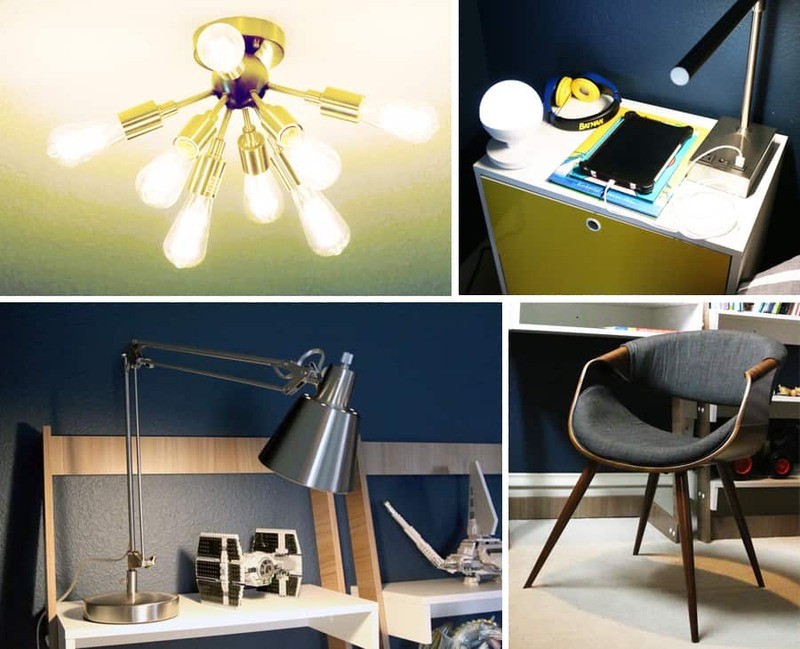 If you missed it, here is the style board that we created with our long-time friends at Lamps Plus. 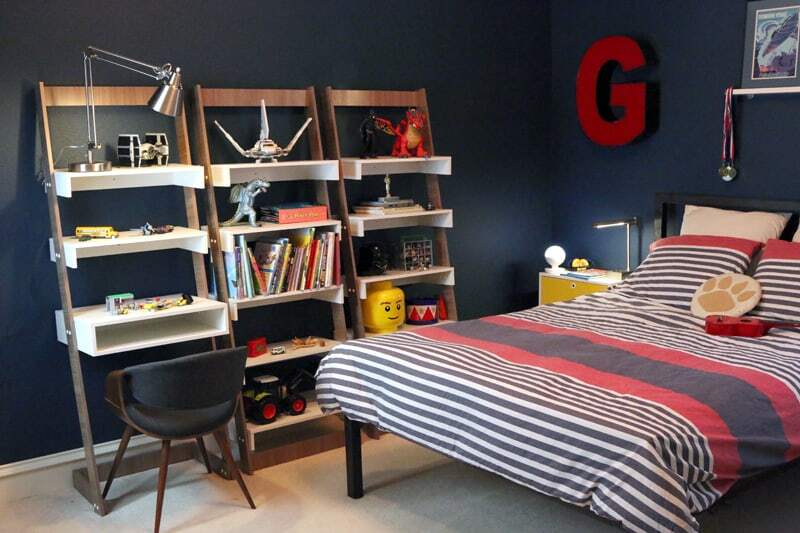 Read on for more pics of Gordon’s new bedroom and all of the sources. We started with this amazing Carpina Home Oak White 3-Piece Ladder Shelf Office Desk Set – Style # 9X411. Check out all Cabinets and Storage here. 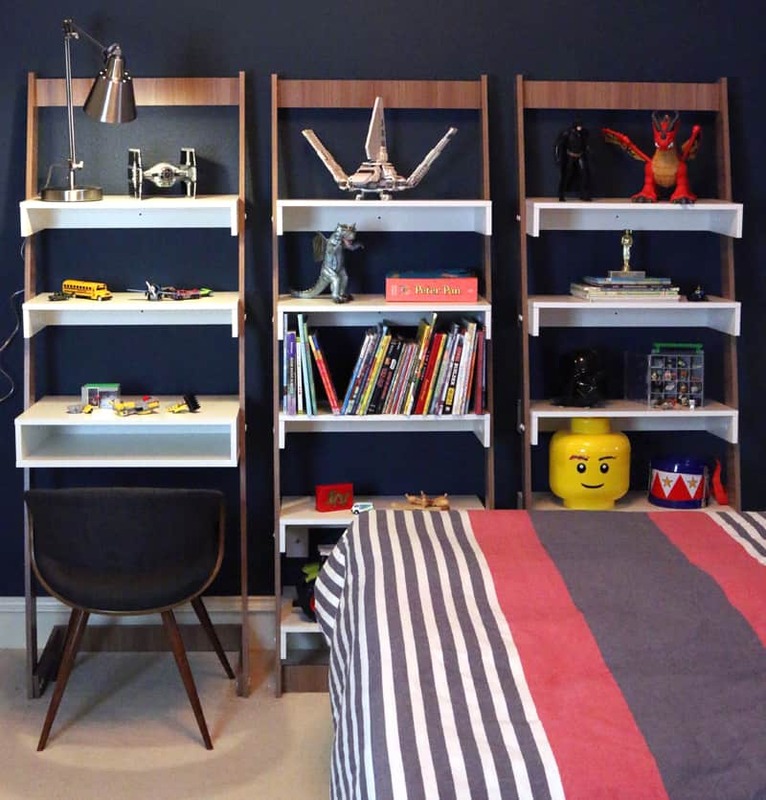 It’s perfect for displaying all of his LEGO creations and will also be great or storing toys in baskets and bins. He is most excited about the desk, which he is referring to as his “Crafting Table,” something all you Minecraft mamas will appreciate. 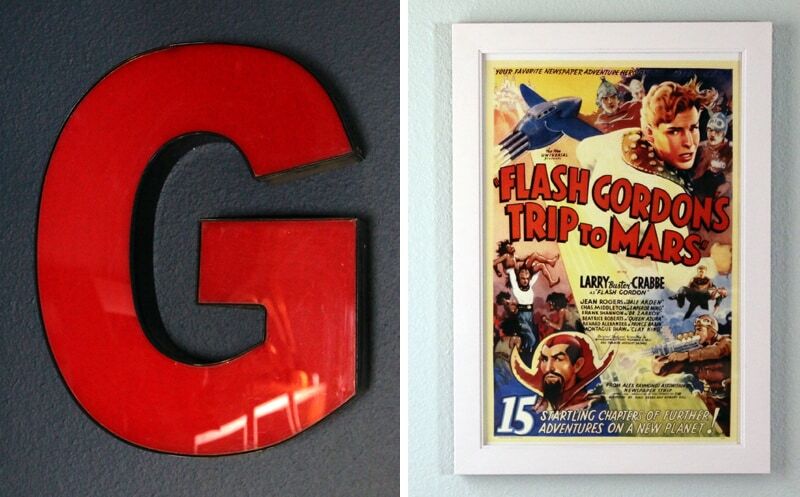 The giant “G” was a find from the Canton Flea Market here in Texas. I’ve been saving it for a few years. 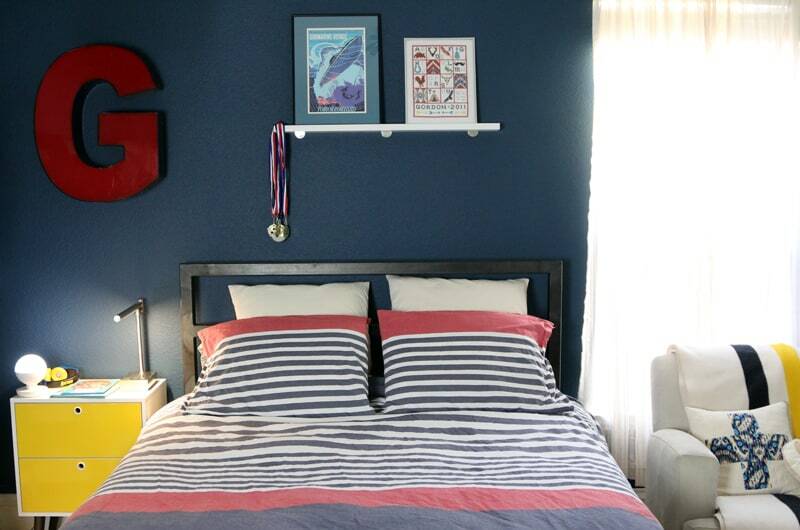 The Flash Gordon Poster is one that has been in his Nursery since he was a wee baby. We painted two walls in Rainstorm/Matte by Sherwin-Williams. It transitions nicely to the light aqua on the other walls and in the adjoin bathroom. By painting just two walls, we kept cost down and kept the room from getting too dark. 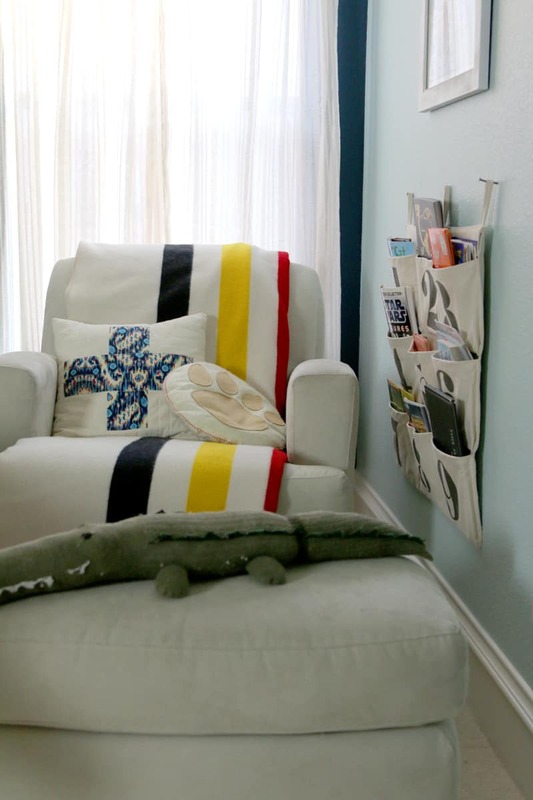 At first I was concerned that the yellow accents would make the room look too “toy store primary” but I like the way the yellow pops and these items will be easy enough to change out for a more sophisticated nautical look as he grows. 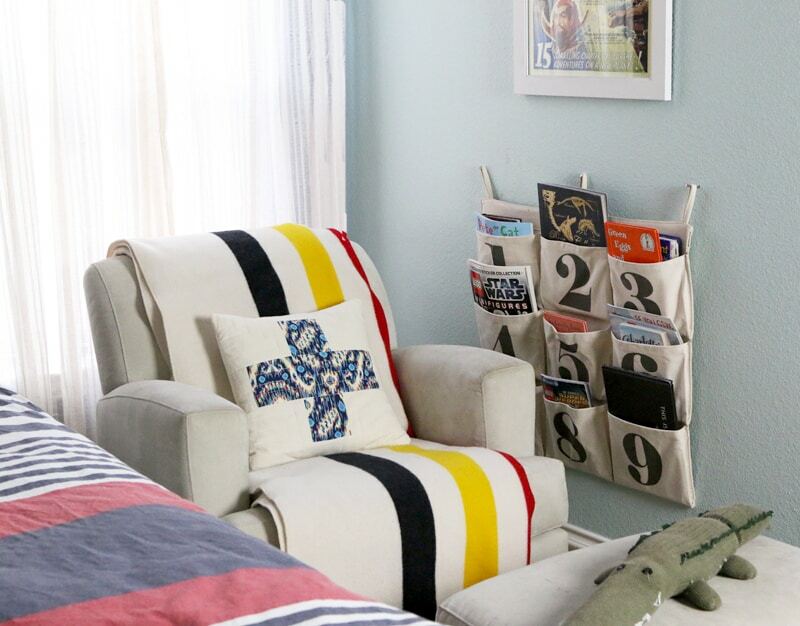 The Southwestern Cross Stitch sampler on his little shelf is a project from our book, Pretty Prudent Home. It’s one of my favorites. For his nightstand, we went with a lamp that features a USB outlet on the base. This is perfect for charging his favorite nightlight and his tablet. We also loved this chic Udbina Adjustable Architects Desk Lamp – Style # 5N881. For the nightstand, we went “modern” with this Taby Yellow Wood 2-Drawer Nightstand – Style # 9X343. You can see all of the Nightstands here. This DIY Swiss Cross Pillow felt right at home in the new room, as did my favorite Pendleton Blanket. 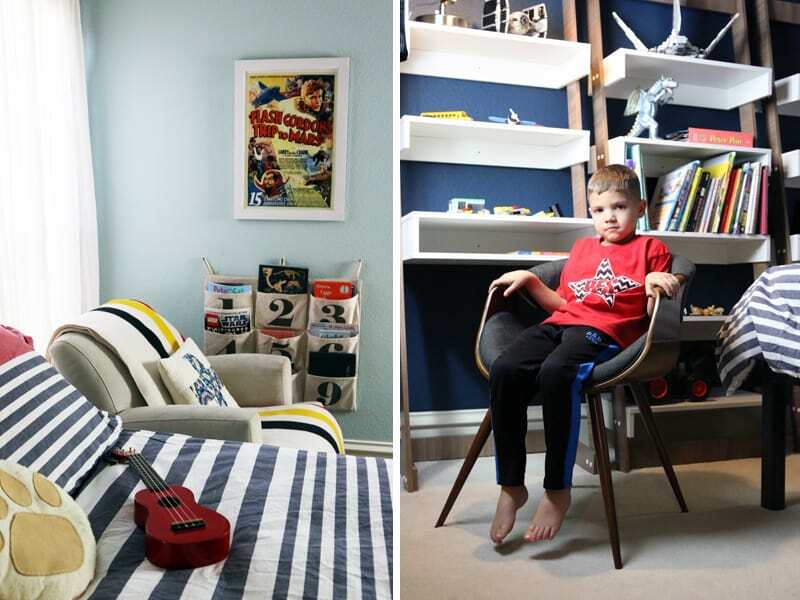 The chair (a nursery relic) is from Room & Board, as is the bed frame. 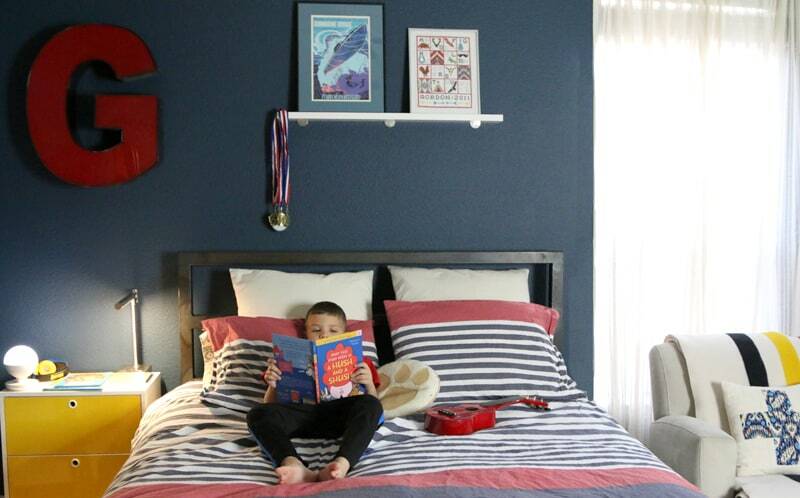 The bedding and the cool hanging fabric bookshelf are from Land Of Nod. That crazy green alligator (or sock-adile as we like to call him was a gift from our friend Jocelyn from The Nesting Spot when Gordon was itty bitty. It’s still one of his favorites. He loves to his his sisters with it. Gordon is in love with his new space. I hope he never leaves. wink. I love love love it. The wall color and that cielong fixture!! !